This one we took from our friends at Bulletproof and Dave Asprey and the Bulletproof Diet. It is as clean as you can make it and also amazingly healthy and delicious. Embrace the healthy fat from the butter and salmon and overall, enjoy. and looking great after eating butter for lunch. Cut your compound butter into teaspoon-size piece, roll a piece of salmon around each piece, and place the salmon-wrapped butter on top of a cucumber slice Sprinkle with salt to taste and enjoy! 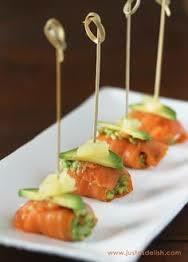 This is like those cream cheese-salmon appetizer rolls, but without the inflammatory ingredients.